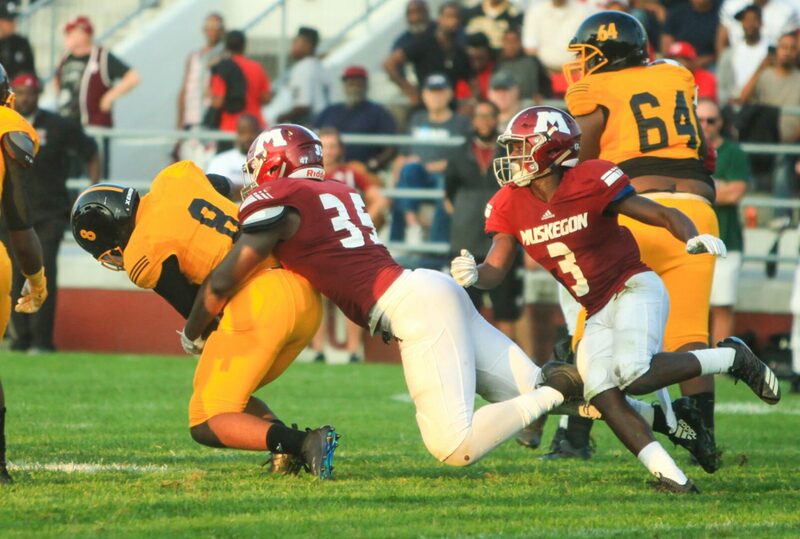 MUSKEGON – It doesn’t get much better than Hackley Stadium on a Friday night, particularly with two of the state’s best high school football teams going head-to-head. A packed crowd of Big Red fans were treated to an instant classic as Muskegon rallied to knock off Detroit King 24-21 with a late touchdown. 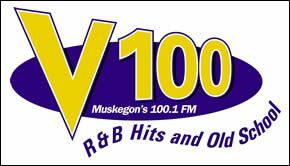 Muskegon quarterback Cameron Martinez scored the winning touchdown on a one-yard run with 1:22 to play to put the Big Reds ahead 24-21. “We just knew all the hard work we put in during the offseason led to that moment, so we responded and came back and fought and we able to get in the end zone,” Martinez said. Detroit King threatened to steal the win by driving into Muskegon territory in the final minutes. 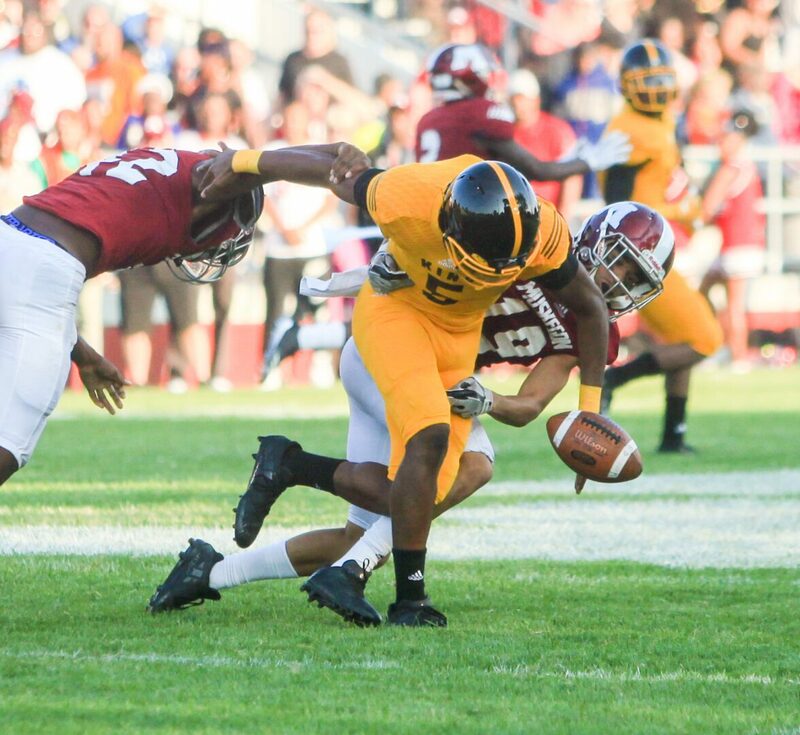 But with just 30 seconds remaining, Crusader quarterback Dequan Finn mishandled a snap and Muskegon’s Billie Roberts was there to pounce on the loose ball and seal the Muskegon win. The Big Reds’ offense relied heavily on the run, with all 309 yards coming on the ground. Martinez led the attack with 154 yards and two touchdowns on 29 carries. King got the scoring started with 4:17 remaining in the first quarter on a 10-yard pass from Finn to Dominick Polidore-Hannah to make it 6-0. Muskegon answered on its next drive with a five-yard touchdown run by Martinez. Carlos Hernandez-Sias’ extra point put the Big Reds up 7-6 with 11:36 to play in the half. 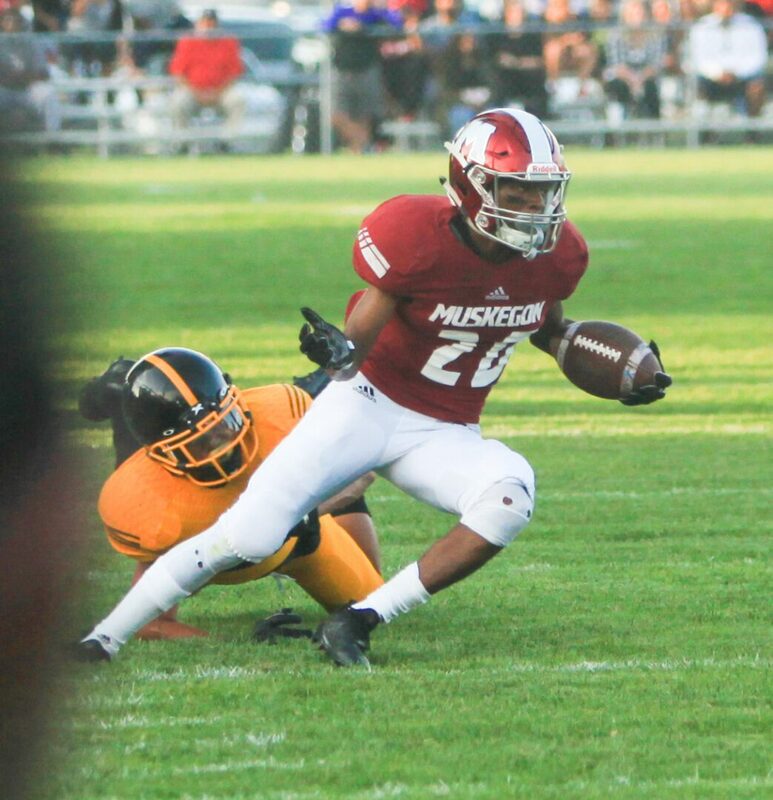 It appeared that Muskegon had extended the lead on its next drive, but a 47-yard touchdown run by Hyrosha Wilson was called back for a holding penalty and the Big Reds were forced to punt. Muskegon’s Kolbe Lewis intercepted a pass on King’s next drive, setting the Big Reds up at their opponents’ 40-yard line. Three plays later, Jakobie Harris bounced to the outside for a 29-yard score , giving the Big Reds a 14-6 lead with 2:14 remaining in the first half. Finn led Detroit King down the field in the last two minutes and scored on an 18-yard scamper. He then connected with Polidore-Hannah for the conversion and tied the game at 14-14 with just 20 seconds left. The first half seemed over, but a big kickoff return and a late hit penalty gave the Big Reds the ball at the Crusader 43-yard line with 12 seconds and two timeouts remaining. After a 13-yard run, Hernandez-Sias connected on a 47-yard field goal as time expired to put Muskegon up 17-14 at halftime. Finn scored the Crusaders’ third touchdown with 5:03 to play in the game to put King up 21-17. That led to Muskegon’s game-winning drive, which covered 65 yards on eight plays and ended with Martinez’ dramatic TD. 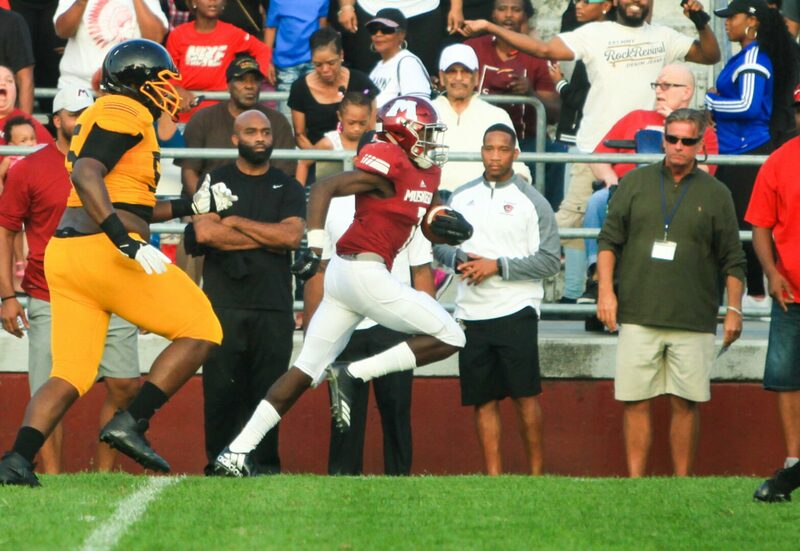 Jeremiah Lockhart had 76 yards on 12 carries for Muskegon while Demario Robinson ran for 44 yards. Ali’Vonta Wallace led the Big Red defense with nine tackles while Lamarion Sherrill totaled five. Finn passed for 264 yards, ran for another 99 and totaled three touchdowns for Detroit King.